I jumped on the "0-12 months onesie," band wagon! I will take a picture each month, as close to the 12th as I can, and we will watch Ryan grow! Last belly picture, before Ryan's big arrival! 5:30AM is way too early for pictures! and we are ready for surgery! Once we were in the operating room, they got started right away! I think total time to put in the epidural and catheter was less than 10 minutes! Ryan was delivered via Cesarean Section at 7:45AM. The nurses quickly whisked Ryan off to the warmer, and cleaned him up. They then called Mike over to cut the cord! Ryan weighed in at 7 pounds 8 ounces. His brother Mikey weighed 9 pounds at birth. Finally in our own room, Mommy and Ryan pose for our first picture! Mikey meets Ryan for the first time. He wasn't sure what to think about his new little brother! Mikey is much happier with Daddy! Thank you Dr. John Anstey! Ryan and I had great care at Missouri Baptist Hospital! My best friend from high school; Jennifer Haake, has her own photography business, and took pictures of Ryan at 2 weeks old. They turned out so cute! I love them! My grandmother; Ruby Lee, came into town to visit with Ryan and bring him a baby quilt. The quilt has bright colors and teddy bears; it's beautiful. Ryan wasn't aware of how special this gift was, but Mommy knows the time and effort it takes Grandma to make her quilts. Her eyes have weakened, and each stitch can be painstaking. So, knowing that she made another quilt for great-grand-baby numer 10, is very moving! Thank you grandma for the love! Ryan and I love the quilt! Ryan went to the doctor on Thursday, to have his "boy procedure." This is him sleeping and happy prior to having it done. The car ride home was horrible, he screamed the whole way home! Poor baby, what did Mommy do to you? The Fortner's had a simple St. Patty's Day at home this year! Ryan had his first "pint," of milk...and the rest of the family ordered corned beef and cabbage from Rookies. The weather was beautiful, so Mikey and grandma played out side. Ryan and I watched from the back door! Hope you had a good St. Patrick's Day. The hospital photographs did not go well...but we have them, and will tuck them away! Ryan, just was not into the many flashes of light, and just wanted to sleep! We wanted to honor a few heros that we love, and used the grandpa quilt as a back drop. 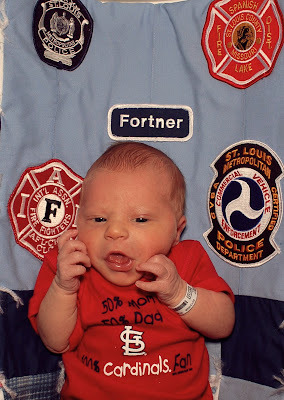 The City of St. Louis police patches are from Grandpa Fortner and the Spanish Lake Fire Department patches are from Grandpa Lee. 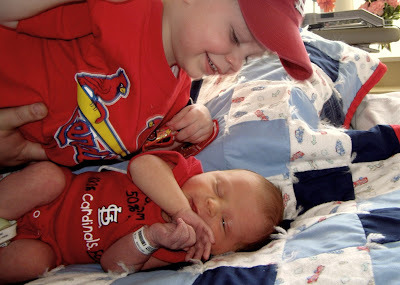 The St. Louis Cardinal shirts were a gift from Daddy! Mikey was not into giving Ryan a kiss or laying next to him. Mommy, Mikey, and Daddy; proud St. Louis Cardinal baseball fans. Ryan and Mommy sitting in the rocking chair. 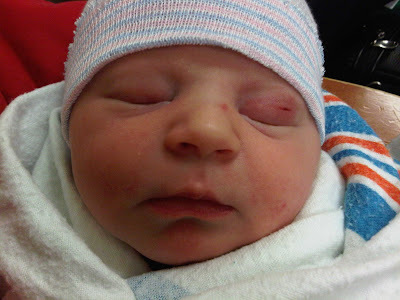 Michael Fortner, Jr., is proud to announce that his brother has arrived! Mikey is now a big brother, to sweet little Ryan Christopher Fortner.